Writer, speaker, anchor, educator and a commentator Paranjoy Guha T hakurta has worked with Business India, Business World, The Telegraph, India Today, The Pioneer, and Television Eighteen. If we want to learn about the complicated issue of money and media operations, Paranjoy’s stories for independent media site THE HOOT are the best source. We are presenting some of his stories and related links for GJ Community to understand the style of corporate working, financial maze and business relationships of Media Mahabalis. First is about 9x-Naidunia-Reliance and another one is about Tehelka. By and large, coverage of the Sheena Bora murder has excluded a 2013 official report suspecting fraud in Reliance’s links with the Mukerjea-owned INX/NewsX group. An article that appeared in November 2013 has suddenly been attracting considerable attention. Reason: the article was about how Peter and Indrani Mukerjea sold their stake in the INX/NewsX media group of companies and how India’s biggest private corporate entity, Reliance Industries Limited, headed by the country’s richest man, Mukesh Ambani, acquired control over these firms for a period of time in a convoluted manner. The Hoot stories looked into the examination of these complex deals by the Serious Fraud Investigation Office (SFIO) in the Ministry of Corporate Affairs. A draft report of the SFIO that looked into these rather unusual transactions involving companies linked with RIL and Ambani as well as a two-page official letter were also made available on the Hoot website. At the time the articles were published, there was apparently not much interest in what I had written. The editor of Hoot, Sevanti Ninan and I, visited the office of the SFIO director Nilimesh Barua in New Delhi’s Central Goverment Office complex on a pleasant winter afternoon. He was politeness personified over a cup of tea and patiently explained why someone in his position could neither confirm or deny the existence of the draft report on Reliance and the INX/NewsX group. At that time, we did not have a copy of the report. Four days later, on November 11, documents containing these sensational allegations were submitted to the Supreme Court on behalf of the Centre for Public Interest Litigation by activist lawyer Prashant Bhushan. The bench of the apex court, comprising Justices G.S. Singhvi and V. Gopalagowda, was urged to order a fresh investigation into the allegations contained in the SFIO’s report. This was part of the larger probe into apparent criminal acts revealed in the telephone conversations of corporate lobbyist Niira Radia that were recorded by the Income Tax Department. One of Radia’s most important clients was Mukesh Ambani. On November 13, the Hoot published the second part of the article with the title “A ‘sham’ transaction” with the introduction: “Thus, it can be seen that the buyer and seller were one and the same group, that is, Reliance. The maze of companies and web of fund movement was created only to hide the identity of the group”. Fast-forward to the present. I was flooded with telephone calls from fellow journalists, many of them based out of Mumbai, asking me what happened to the SFIO investigation into the INX/NewsX group. I replied that to the best of my knowledge, nothing much had changed and that the draft report of the SFIO (recommending criminal prosecution of certain individuals involved in the transactions) had not been acted upon during the tenure of Sachin Pilot, the former Union Minister of State (holding independent charge) of the Ministry of Corporate Affairs, who held the post from October 2012 till the end of the second United Progressive Alliance government in May 2014. I suggested to my journalist colleagues that instead of me, they should contact the current minister in charge of the Ministry of Corporate Affairs, Arun Jaitley (who also happens to be Finance Minister and Information & Broadcasting Minister) to find out what happened to the SFIO investigation on the INX/NewsX group’s links with Reliance. That anything and everything to do with the Mukerjea couple would attract the attention of the media is hardly surprising. What is also not unusual is that there should be intense speculation about the real reasons for the abrupt transfer of former police chief of Mumbai, Rakesh Maria, who was reportedly not only personally taking great interest in the investigation into the murder of Sheena Bora (Indrani’s daughter who she claimed was her sister) but also probing whether there was a financial angle to the case. A number of reports have appeared suggesting that Maria’s transfer may have been prompted by his ‘over-zealous’ inquiries into the “big” people who were allegedly involved in business transactions with Peter Mukerjea and by his keenness to follow the financial trail behind the sale of INX group firms. Mukerjea left his job as head of STAR TV’s operations in this part of the world, to embark on establishing his own media venture together with his wife, Indrani. The financial dealings of the couple have been under investigation for a few years now but they had, until recently, by and large stayed out of the public eye. In an internal audit conducted on the INX/NewsX media group by investor Temasek Holdings of the Singapore government, a number of instances of alleged misallocation and siphoning off of funds by the Mukerjeas were reportedly observed, which apparently led to Temasek selling its shares in the group. 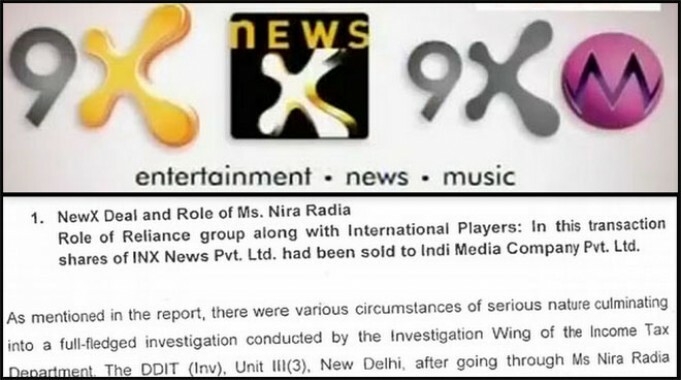 The 2013 draft report of the SFIO had revealed that investigations conducted by the Income Tax Department “proved beyond doubt that the sale of NewsX channel” to a company called Indi Media Co Pvt Ltd – by way of subscription of equity to the extent of 92 per cent of INX News Pvt Ltd – was a “sham” transaction and a “premeditated plan” of Reliance Industries to fund the latter corporate entity “through its front companies” employing a “web of transactions”. The November 2013 articles published in the Hoot remain the only articles that have covered the SFIO report in detail. According to the SFIO report, the allegedly fraudulent set of transactions are linked to corporate entities controlled by Radia, a Mauritius-based associate of multinational investment firm New Silk Route (with which were associated Rajat Gupta and Raj Rajaratnam who have been found guilty. of insider trading charges in the US) and a gas transportation company that was a subsidiary of RIL, which was supposedly “converted” into the “private property” of Mukesh Ambani “through a maze of private companies” in what the SFIO has described as a “classic manoeuvre”. “Thus, as the evidence unfolds, the promoter group companies of Reliance advanced funds in the guise of convertible loans only to acquire equity in INX Media and IM Media Pvt Ltd. The two companies in turn acquired the equity of INX News Pvt Ltd which was operating the NewsX channel. Hence, (on the) one hand, the promoter group companies of Reliance advanced funds to acquire equity of INX News Pvt Ltd at a premium and, on the other hand, one of the RIL companies, namely, Aarthik Commercials Pvt Ltd advanced funds to Indi Media Co Pvt Ltd through Suvi Info Management Pvt Ltd to acquire the same equity from INX Media Pvt Ltd and IM Media Pvt at Rs 10 per share at par causing wrongful loss of Rs 168.50 crore to … INX Media Pvt Ltd and IM Media Pvt Ltd and an equivalent wrongful gain to Indi Media Pvt Ltd.
Barring a few newspapers and magazines, most publications have refrained from mentioning the ‘R’ word in their reports and have merely suggested that a large company may be involved in the shady transactions. India Today (August 29) alluded to RIL anonymously as a “corporate” that was involved in “sham” transactions with regard to INX. On the same date, Business Standard referred to “a large corporate entity” involved in the deals, while the Economic Times too did not mention RIL while reporting the financial dealings relating to the INX group. While the entire media in India have gone to town reporting on the Mukerjeas in excruciating detail, including the fact that Sheena Bora used to work for a company which is part of the Anil Dhirubhai Ambani Group (led by Mukesh Ambani’s younger brother), many publications and television channels have been circumspect in mentioning the Reliance connection with the Mukerjeas. “Thus, it can be seen that the buyer and seller were one and the same group, that is, Reliance. The maze of companies and web of fund movement was created only to hide the identity of the group”.PARANJOY GUHA THAKURTA unravels the SFIO documents reported earlier on the Hoot. Anant Media’s losses rose from Rs 39.5 crore in 2009-10 to Rs 55 crore in 2010-11 and further to Rs 66 crore the following year.In 2012, Royal Building headed by K.D. Singh invested close to Rs 32 crore in Anant Media by buying 1,30,510 shares of the company at a premium of Rs 2,505 per share. Records of the Registrar of Companies (RoC) in the Ministry of Corporate Affairs show that at that time, besides Royal Building, other shareholders in the company publishing Tehelka included London-based fashion designer Priyanka Gill (2.14 per cent) and two high-profile politicians from the country’s two largest political parties, Bharatiya Janata Party MP and former Law Minister Ram Jethmalani (0.08 per cent) and current Law Minister and Congress MP Kapil Sibal (0.04 per cent). and MOHAMMAD GHAZALI on the hoot.